GIVE ME YOUR BEST SHOT, PAL. I CAN TAKE IT. Jack Burton has angered a lot of folks in his day, but this time he might have really done it. With both Heaven and Hell out for Jack’s head, there’s nowhere left for him to hide. It’s a battle of apocalyptic proportions, but ol’ Jack Burton won’t go down without a fight. Gas up the Pork-Chop Express and get ready for the final ride! 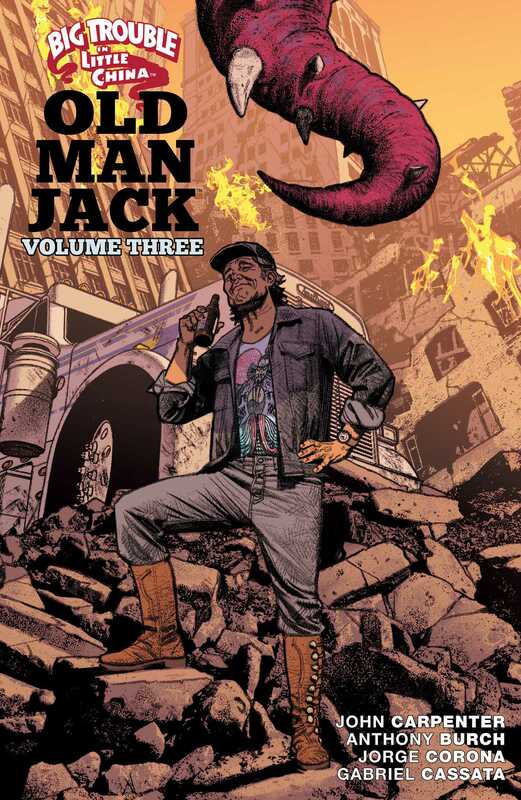 Written by Anthony Burch (Borderlands 2) and horror icon John Carpenter, and illustrated by Jorge Corona (We Are Robin, The Flash), Big Trouble in Little China: Old Man Jack Volume 3 collects issues #9-12 of the authorized, in-continuity sequel to the fan-favorite film.